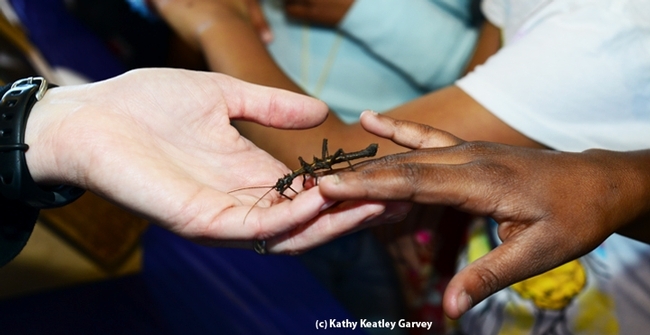 Who wouldn't want to get up close and personal with bugs? And maybe give them a hug? Or two? Or three? 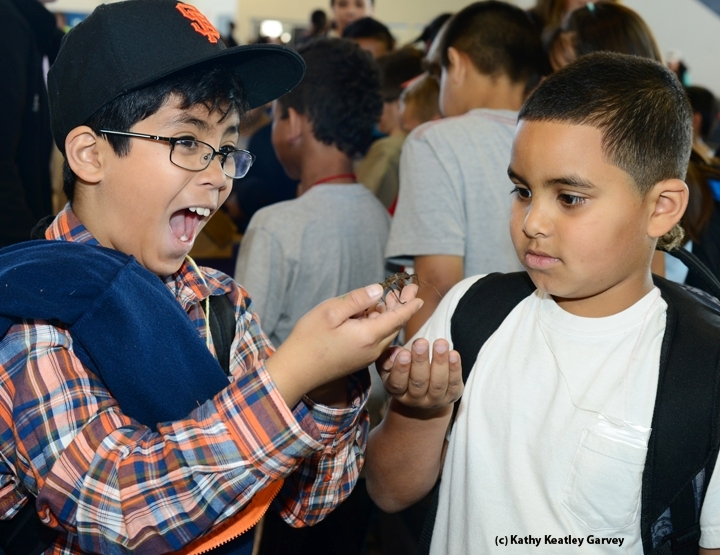 Some 3000 third-graders who participated in the annual Solano County Youth Ag Day on March 18 at the Solano County Fairgrounds made a beeline for the bugs at the Bohart Museum of Entomology's hands-on activity. The UC Davis-based insect museum, directed by Lynn Kimsey, provided just one of the activities on the Vallejo fairgrounds, where the youngsters visited cows, rabbits and chickens; watched sheep-herding dog demonstrations; participated in 4-H SET (science, engineering and technology) events, and went home knowing that chocolate milk doesn't come from brown cows. The bugs? Oh, sure, some of the youngsters were initially a little squeamish and squirmish when they saw the Madagascar hissing cockroaches and walking sticks. But the "fear factor" soon vanished as they watched the insects crawl up their arms. The bugs tickled and the youngsters giggled. Tabatha Yang, the Bohart Museum's education and outreach coordinator, said the youths really enjoyed the "hissers" and "stick insects" and learning more about them. 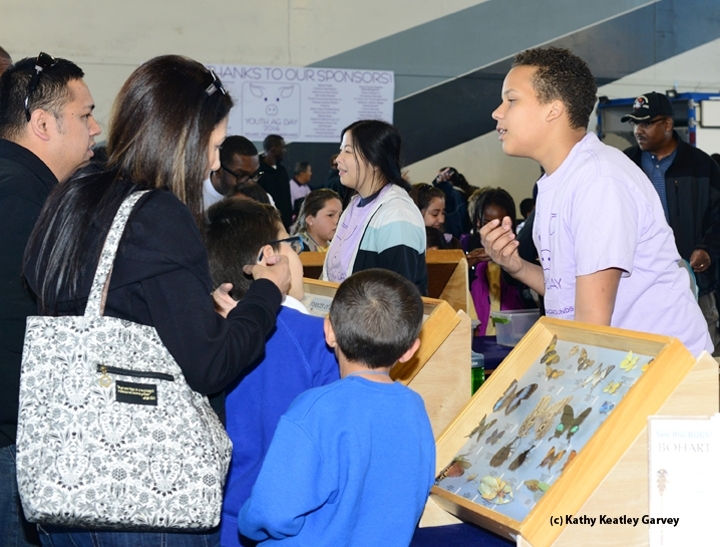 Bohart museum volunteers Maia Lundy, Noah Crockette and Rachael Graham delighted in showing the bugs to the youngsters. A display of bee and butterfly specimens also drew "oohs" and "aahs." The Bohart Museum, home of nearly eight million insect specimens, plus a live "petting zoo," traditionally provides an educational display at the Solano County Ag Day. The Solano County Fair Association hosts the annual event. Next up in the Bohart Museum's lineup of educational activities: an open house from 1 to 3 p.m., Saturday, April 12 at its headquarters in Room 1124 of the Academic Surge Building, Crocker Lane. It's part of the campuswide Picnic Day. Thank you Kathy for the wonderful photos you took. You captured the look of 'AHH' on the childrens faces. Good job! Thanks! Kids 'n bugs go well together!